Tray system hold 1000s of different parts in small space. Electronic circuits are constructed from a large number of different components, most are very small and many lack any means of identification. Engineering Stock: Used by technical people to design, debug and rework electronic assemblies. Engineering stock consists of a large array of components in small quantiles that can be quickly located and accessed. Reel & Cut Tape Stock: Reels of component tape are the most common packaging format. 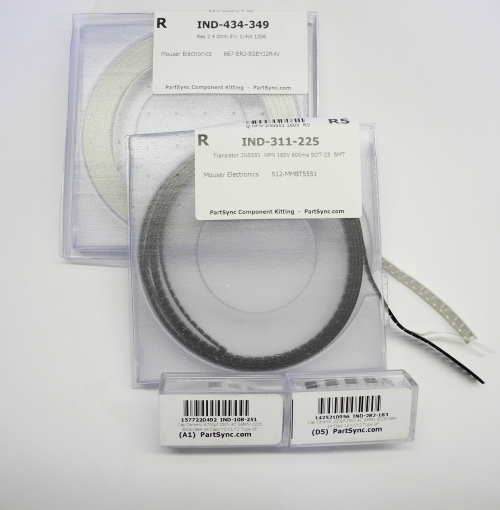 Large labels for reels and small labels for component tapes are provided. Plastic trays and accessories are available to simplify the handling of engineering and cut tape stock. 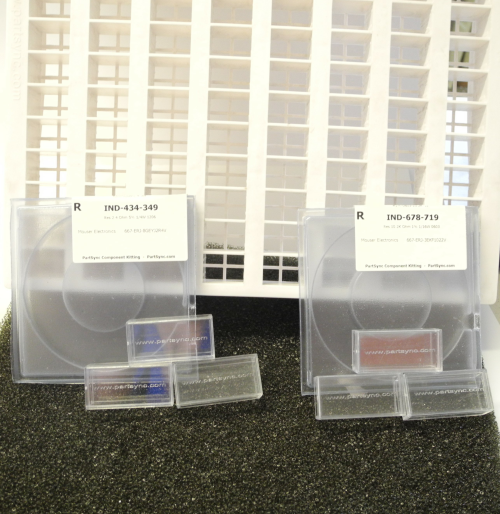 Small boxes hold any and all loose engineering stock, or have a strip of cut tape in our custom made plastic reel holders. This storage allows for easy finding of parts using labels with bar codes. Using these plastic containers allows hundreds of different components to be easily organized and arranged within a few feet of shelves. Special coding on labels allows instant location. Label all of your parts with easy to print labels and barcodes. Wired or Wireless bar code scanners easily scan your labels and locate parts in your database. The bar code on a package of parts destined for a kit must indicate not only the "Part Number" for the parts in the package but it must also identify the "Kit" where the parts will be placed. It could be the case that a received part package is to be used in two or more different kits. 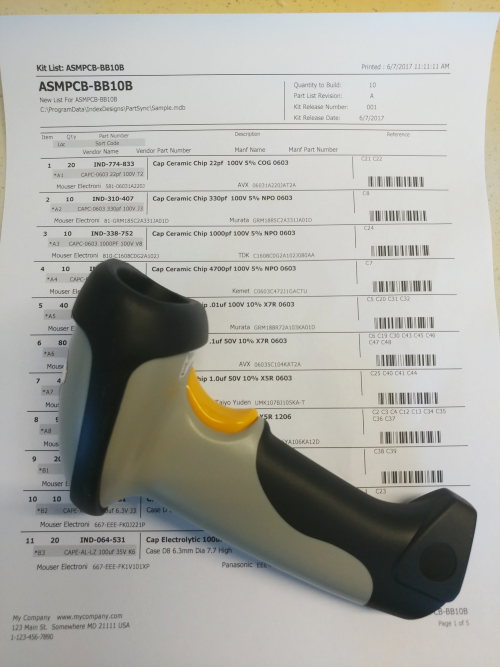 Many existing MRP systems use simple "Part Numbers" bar codes to identify a container and users are left to figure out from purchase order notes how a physical package is to be handled. PartSync uses unique container key codes which can index into container routing controls. Identifying the actual Part Number and part description is a trivial side task done in software. Custom labels for each storage type. PartSync will print on a large array of printner. Any Windows printer with the correct label sizes can be used. Existing drivers support low cost Brother Printers to large more expensive Zebra printers. Create labels for every part that you have in stock. Labels easily go on reels, cut tape and on the small engineering containers. Each label will have the generated part number from your database with all the information on what part is inside. PartSync is a desktop database application used to manage electronic part data, Bill of Materials (BOM), component kits and vendor purchase lists. PartSync provides advanced features for labeling, material storage and bar coded labels. Search engines make finding parts and part information fast and easy. A datasheet librarian organizes component documents and a PCB Footprint library supports PCB design activities. PartSync provides several features that MRP system tend to ignore. These include various label styles, bar codes, shelving codes, search engines, Datasheet Librarian and CAD tool interface. PartSync operates in a "Disconnected Mode" where database consistency is maintained through shared "Repositories". This mode allows remotes users to work on projects while "Off Line" from remote database servers. Most large MRP / ERP systems are client server in nature where a database server (typically an SQL server) runs on a Windows Server or Linux machine. Workstations (the clients) connect via a local LAN or perhaps using a VPN through the internet. The advantage of a client server system is this single server runs 24/7, is not used for running desktop apps and is powered through an Uninterruptable Power Supply (UPS). The same architecture applies to web based SaaS services except the server is remote based. This is a very reliable architecture for database servers though it does requires special hardware and software and it introduces a single point failure. PartSync is completely different. The database engine is the JET/ACE system now part of ever Windows OS since Win XP. These database tools are very robust, Microsoft has used this engine to power the LDAP protocols (Windows login and Directory Access) since Win NT. Running a client machine on a UPS, or sharing the JET/ACE file (.mdb or.accdb) on a LAN file share provides the full client/server reliability at much lower complexity nd cost. With each client fully self sufficient there is no single point failure possible. Each client maintains a complete set of data backups which eliminates central server backup requirements. Since the ACE/JET DB tools are built into Windows, and since a single .mdb or .accdb file transports the entire database, remote users do not need to connect with a remote server when working with part data. PartSync includes support for synchronizing client data with remote "Repositories" which keeps all clients up to date. CAD libraries can be greatly simplified. With three schematic symbols (Resistor, Cap and Polarized Cap) and a few PCB footprints (0603, 0805 and 1206) many tens of thousands of parts can be fully defined. Output from PartSync can be used to back-annotate schematic with PCB Footprint data keeping schematics simple and libraries tiny. Designers can now work in parallel remotely as libraries are greatly simplified.